It has been sometime since my last entry – 3 months. Yikes. The time certainly flew and I haven’t knit as much as I would have liked. 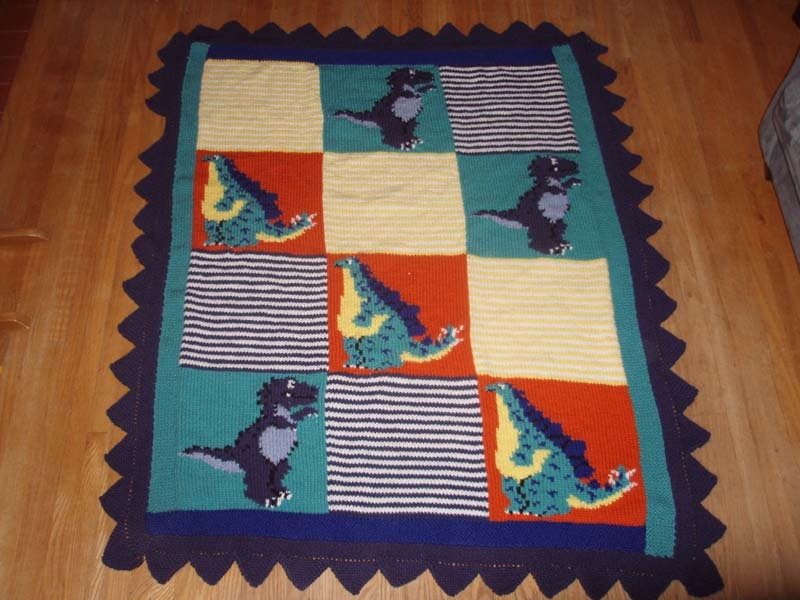 I did finish the dino blanket and it looks great. It was a big job, especially the 50 triangles that made up the outer border. I’m really happy with the finished product. I started to make the stuffed tyrannosaurus to match but I haven’t gotten the urge yet to do the duplicate stitch finishing and then finish up the other parts that are left undone. It is a giant at 2ft tall at pattern gauge. Since I get nowhere near that with chunky instead of worsted yarn it is more like 2.5 ft tall. I need time to concentrate for a long period to do the finishing and I’m not sure that will happen in the near future. I also finished the Scylla socks for my sister and I think she’ll really like them. They’ll be a birthday (Nov) or holiday present. Knit blogging has not been a priority as of late. I have been busy – not knitting, but writing. Not blog posts but manuscripts. I have finished and submitted two papers since the beginning of January and finished a decent draft of a third. Ok, the not knitting thing isn’t entirely true. So actually writing all that out I realize there was a lot of knitting going on in this house in the last two months. Of course writing and knitting are highly compatible activities. You write, you want to rip out your hair, you take a short break and knit a few rows, suddenly feel reinspired, return to writing – repeat * 1000. Really 7 FO: 3 manuscripts isn’t really a bad ratio. I have been a neglectful blogger. However, it is not my New Year’s resolution to blog more. I will just have to do it when I have time. I hit the ground running in 2010. I’ve started back into some academic work so I have been very busy lately with little extraneous computer time. As a grad student, there was always time for computer things while working. A certain amount (well a large amount) of procrastination was necessary. As a Mom paying for daycare so I can work, this is not the case. I try to get as much done as possible in my limited work hours. Things have been productive. I submitted a final draft of the Birds of North America account for the Black-capped Chickadee yesterday. I started working on it in September so it has been a lengthy project. I am also nearly finished revisions of a manuscript that was rejected one whole year ago. I’m hoping the year interval before re-submission hasn’t hurt our chances. I don’t think I was ready to work on it until now. Not just that I couldn’t, but I didn’t want to. My last thesis chapter was just a tangle of complicated data and once I sent it off to Behaviour, I wanted to be done with it. I didn’t want to do the reviews. Now that I’ve had time to digest it and re-visit with fresh eyes, I realize that it is a good paper and needs to get out there and I’m willing to put in the mental effort. I think a year away was a good thing for me, mentally. I am still excited by what I do so I think that means that I do want to continue doing it. I wasn’t so sure when I finished my PhD about what the future would hold. I’m still not, given that my employment is limited. I will continue to look for employment in my field and not just look for any job that will pay the bills. I’m not sure I would be happy if I wasn’t doing this. It’s nice to know where I belong, even if I haven’t found the exact place yet. Look at that Angelic face! I have been knitting but not at my usual level of productivity. The Christmas knitting extended past the actual holiday. In fact, I am still not finished Marley’s stock though I am past the heel of the second sock and just have the leg to go. I finished Bender for Matt. He sat atop the tree in place of the angel that none of us believe in. Well, we had a star but I don’t believe in its symbolism either. 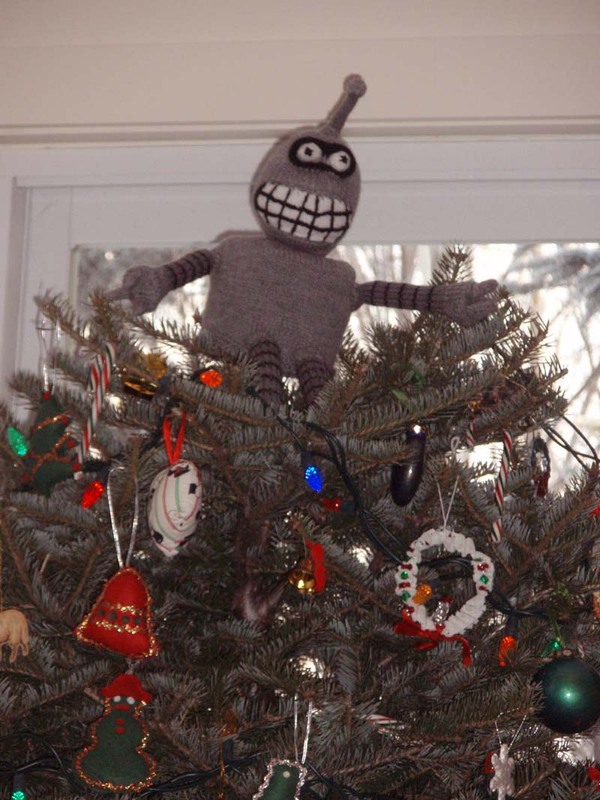 Bender Bender Rodrigues, is the perfect tree topper in my opinion and it was a great way to surprise Matt on Christmas morning. I hid the star so my mother couldn’t replace it before we got up. I’m sure she wouldn’t have but I had to be sure. When I started Bender, I knit his body and then half his head and then stuffed him in a bag for months. It took the countdown to Christmas to get me going again and I am truly glad that I did. I knit Rowan another sweater. 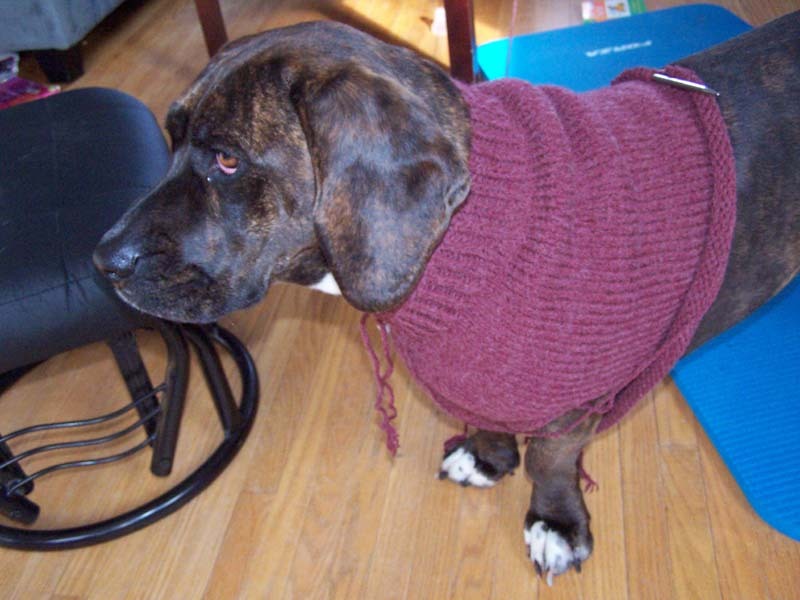 He had only one that fit and I think he should have at least two Mommy knit sweaters for the winter. It turned out well and yesterday I just finished a matching hat with earflaps. Here is the sweater but I haven’t managed to wrestle him into the hat for a picture yet. Hats only work in my house when combined with mittens. Mittens make it hard to remove hats! It is knit in Stylecraft Life DK. I really liked the yarn and bought some more for next year’s sweater. Well I hope it is next year and he doesn’t grow so fast that it is sooner than that. Well that is about all for now. I will be back when time permits. After months of hibernation, I have finally finished Rowan’s bear suit. It took many hours of sewing to get all the pieces together. The finishing took almost as long as the knitting given that it was quite a chunky knit. I spent the evening of Friday November 13th sewing it together at Wool-Tyme. If the store hadn’t held the event I may never have finished. I’m glad I did though and I’m pleased with the way it turned out. I find the legs and arms are a big narrow but it is stretchy so I think it will work just fine. When I tried it on Rowan for the first time, Rosa was very confused. Rowan looks like a little Ewok in it and had his back turned. Rosa had been sleeping and hadn’t noticed what was going on and when she caught sight of a strange creature in her house she was very startled. She moved slowly towards him woofing like she does when she sees the long, white, haired hippy or when she’s startled or alarmed. 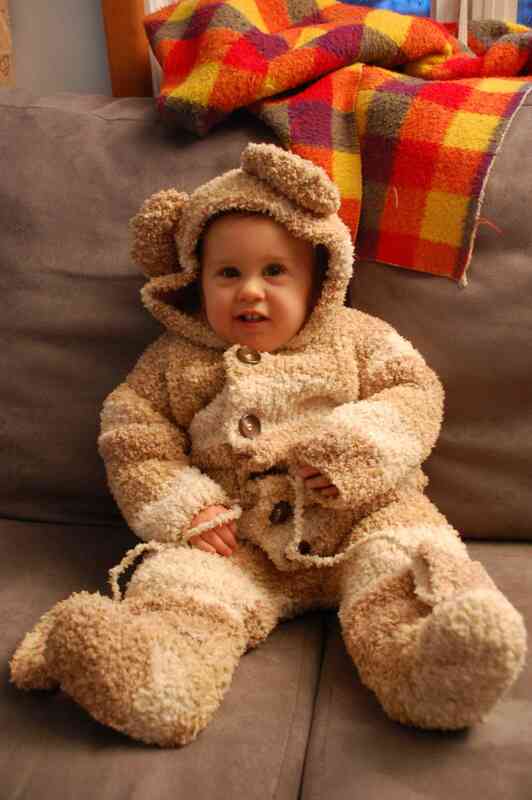 Just as she was getting close, he turned around and she relaized it was just Rowan inside his bear suit. It was hilarious. Lately I’ve been knitting a few pairs of socks. I finished a pair for Joe in On Your Toes Boot Socks which has been sadly discontinued. I also knit a pair of Lake Geneva socks for Robyn in pink and purple from Van der Rock Yarns. 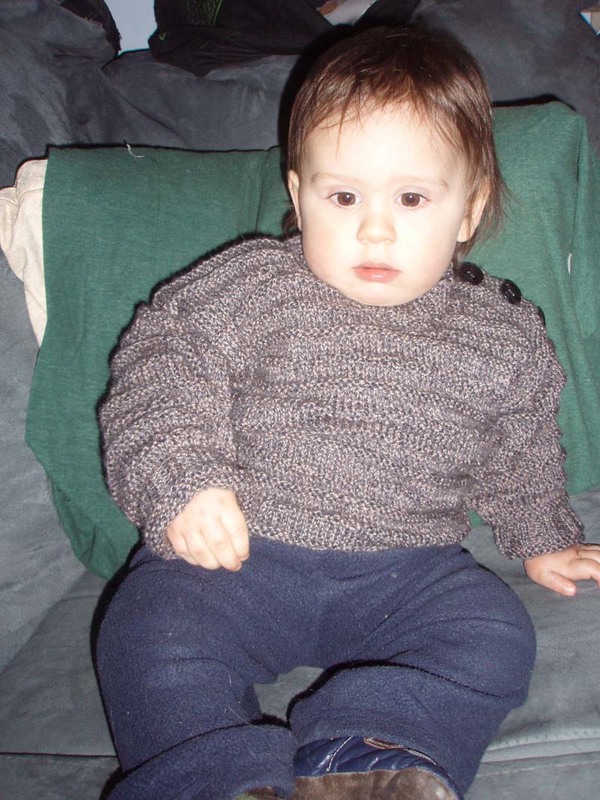 I knit Rowan a cabled cardigan in Countrystyle DK. It turned out really well. I sewed the buttons on it at the same time as the bear suit. I just don’t really enjoy sewing on buttons but somehow, the more buttons there are, the more likely I am to sew them on. I prefer to sew buttons on several things that have been piling up if I’m going to bother getting out the thread. Last night I finished a pair of longies striped like candy canes. They just finished lanolizing in the sink and I’m looking forward to them drying so I can see how they fit. The last pairs I made in April still fit but are getting a bit short in the legs and rise. I will keep using them for awhile until I’ve knit a few more new pairs and then we’ll pass them on to Reed. I haven’t had much time to write. Well, that is partially true – I also didn’t have any new pictures downloaded or much to write about. – Blaze – it turned out better than expected. Pictures will come eventually. I haven’t had a chance to take any. We had a great belated Thanksgiving celebration, followed by pumpkin carving. The very next weekend was Halloween where Rowan was a skunk, I was Smurfette and Joe was a BUI (biking under the influence). Now we have a nice quiet week to relax…. Right, we’ve been joined many times this week by a little fireball named Charlotte who is a pug/beagle mix and is very sweet but sometimes high maintenace. Rosa is very gentle with her, despite her considerable size difference. We decided to make our annual Thanksgiving camping trip despite lower than preferred temperatures. 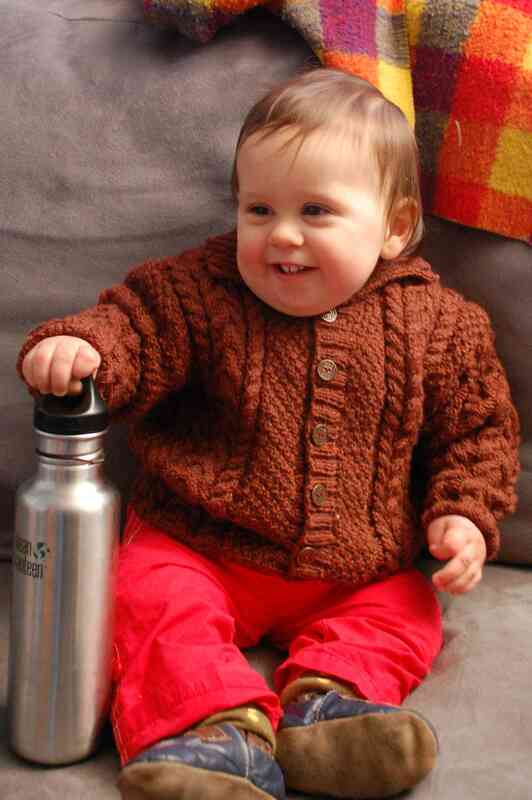 It was a good opportunity to make use of various types of knitwear and drink lots of tea. Rowan and I got to wear our matching hats. We opted for Frontenac Park instead as the forecast was better than for Charleston Lake. The paddling/hiking distance to our site was about the same and we could reserve it, which meant we didn’t have the added stress of first come, first serve. The leaves were gorgeous and the weather held out. Matt and Robyn, and Rachel and Dudley came with us so it was a festive occassion complete with pumpkin pie and turkey chilli. We all bundled up and had a nice fire each evening to keep warm. Rowan was perhaps the warmest of us all. He had lots of warm fuzzy clothes to wear and didn’t complain at all. Rosa did complain. She was quite cold and had to borrow some clothes from her Dad and brother. When Rowan was done with his Fisherman’s Wool bunny suit each day, Rosa wore it as a cape all evening. Poor girl had her own sleeping bag and thermarest yet still had to worm her way to the bottom of Joe’s to keep warm at night. The girl does like to cuddle. Now that fall is officially upon us I feel the need to get out and enjoy every day before it is much colder and perhaps much snowier. The trees in the city still have lots of colourful leaves so it is a good time of year for walking. I’m still working on knitting Blaze and Bender but I’ve put them on hold to knit myself a pair of Tuffy hiking socks. I somehow imagined that I would knit them while I was camping. This was, to my credit, a doable feat. There was plenty of time and they knit really fast. I knit the toe on the way to the park in the car and then that was it. It was too cold for knitting and I was pretty tired from the combination of cold weather and poor sleeping to really feel much like it. I started the socks though with the cable I need for my second sleeve so I have the finish them before I can return to Blaze. I finished the first one on Tuesday night and yesterday I knit until just past the heel. If things go well, they should be done today. I do need to get going on the other things…. I feel like the week before Thanksgiving I am always monitoring the forecast closely. Once again we’re trying to go camping and really hoping that the forecast will improve before the weekend comes. Last year it was cold and damp for all of early October and then suddenly the weekend was nice with only a day or two warning. We went to Charleston Lake and had a beautiful and sunny weekend. I sat in my lawn chair and knit and looked out at the lake. The pre-weekend weather is similar this year and the forecast is still predicting weekend rain but I’m holding out hope for a repeat. We’re expecting Rachel and Dudley, and Robyn and Matt to come with us so it should be a great trip if we can get there. I’ve been working away on Blaze and I’m just a few rows from the armpits on the body. Then it will be the nice short and sweet sleeves. They’re short to begin with but I’m making them even shorter. I don’t think I have enough yarn to make them longer and sleeves that end at the elbow just aren’t flattering so I’m going for short sleeves. Since I’m re-writing the pattern to make it my size, I might as well. I’ve also started work on Bender, which is a Christmas present for Matt and the first of my holiday knitting. I’m a bit late starting this year. I’ve finished his body and I’m part way done the head. There are a lot of pieces so there will be lots of seaming and end tucking. Hopefully I can finish it before the Friday the 13th part (November). The point is to work at UFOs and I expect once the knitting portion is done it will become a UFO since I avoid finishing up. That and Rowan’s bear suit will be my Friday the 13th punishment. I know, knitting is supposed to be enjoyable, and it is, but for me finishing is not always. That is why I like Blaze, Even the armpits are grafted so the only finishing is tucking in ends. That I can deal with. Rosa has a new friend. Her best-friend (in Kingston, not to sell Dudley short) Rumi passed away a few weeks ago and Colleen has just gotten a new puppy, Shiva. She is a Weimeraner/Lab cross and is a real sweetheart. She’s very calm and gets along great with Rosa. She’s already been over for a playdate and was really great. Well she does have one problem (for me) – she likes to try to bit my yarn while I knit. She will be trained, of course, to leave the knitting alone but I expect it will take time and a bit of frustration. I hope for sunny days on her visits from now on. It was raining on Sunday and Rosa refuses to go out when it is raining, even when her friend has gone out too. She takes after her Mom. Oh yeah – and we grew the funniest carrot in our garden! I know, I know. If you look closely he has been Lorena Bobbited somewhat. I had to sort of stick him back together for the picture. Joe thought that he could take it to eat for lunch. He forgot how I enjoy photographing oddities such as this. In my opinion, this is a far superior occurrence to say a Cheeto Jesus (Cheesus, come on people) or a grilled cheese that looks like the Virgin Mary. So what if those foods look like fictional characters, my carrot looks like a three-legged man.